"I've been working with Brown Packaging for almost 4 years now. When issues of packaging come up my first thought is "I wonder if Brown can help us?" The answer has always been YES! Thanks." Sealed Air "Instapak" foam in place has been available for a long time and continues to perform very well. 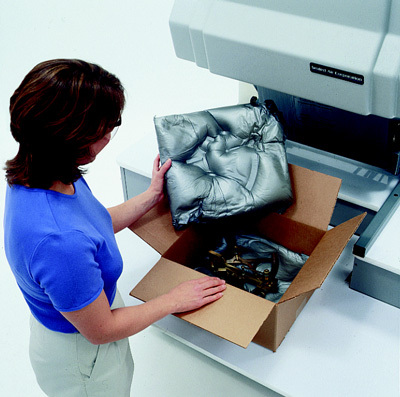 In many packaging applications, it can reduce the amount of cushioning required, and speed up the packaging line over other methods. One of its many strengths is its versatility, ranging from protecting delicate precision components, to high speed void fill, to blocking and bracing of ultra heavy items. What has changed over the years are the many new dispensing systems available. Give us a call and ask about "Foam-in-Bag" systems, "Foam-in-bag" molding, "Speedy Packer Insight" and the "Instapacker Tabletop." It's still the same great cushioning methodology, just better. Contact us today for more information or to purchase Foam in Place Packaging solutions.